Forget what’s inside the package, it’s often the outside that can cost a bundle! Gift wrapping alone has fast become an art as well as a drain on the budget. The good news is, though, that you don’t have to trade your cash for flashy packaging. You really can keep your budget and get great gift wrap, too. Keep reading to find out how to do it. Skip purchasing gift boxes. Instead, visit shoe stores and ask for extra boxes or repurpose empty cereal boxes, oatmeal containers and cracker boxes. You’ll effectively through the recipient off course and heighten the anticipation. You’ll help the environment by reusing an item another time prior to pitching into the recycle bin. And you’ll save yourself some added cash, too. For gift trimmings, think beyond the traditional. Gift toppers needn’t be confined to only ribbons and bows. Small strips of aluminum foil can look phenomenal carefully laid across gift boxes. (The foil reflects all the beautiful lights when placed under a Christmas tree.) Yarn and strips of lace make fun and unexpected present ties. Or, if you’re finding you’ve just got too many ornaments on your own tree, consider tying a pretty ornament to loved one’s gift. You’ll thin out your own collection and the recipient will think of you when they add it to their collection of holiday trimmings. Forget purchasing gift “To/From” labels and tags. Make them yourself quickly and easily on the computer using just plain paper or adhesive labels. If you have young children, consider enlisting their help to create miniature works of art that can double as tags. For even more simplicity and yet more fun, skip the tags and bows entirely. Instead, opt to use individually wrapped tea bags as the “tags.” Just use a permanent marker to label them with the “To/From” information. You’ll avoid wasting money on something only to be used once and the recipient will enjoy the added bonus of a cup of tea, too. White lunch bags can be beautiful. Whether you decorate the bags themselves with glitter or holiday stamps or just tie them off with some pretty holiday ribbon, white lunch bags are economical, convenient and environmental friendly. Truly, a win-win-WIN! 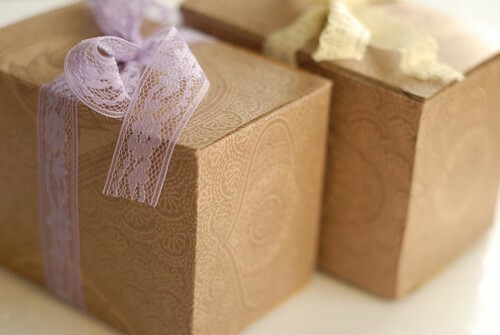 All things being equal, opt for items already packaged for gift giving. Now days many items—from gloves to candy to bath products—come already beautifully boxed. When this is the case, skip the urge to essentially wrap it a second time. Someone’s already done the work for you. Accept the gift of time and savings such a purchase extends to you! Let someone else wrap it up! If you shop somewhere that offers free gift wrapping as a courtesy, by all means, take advantage of it. Granted, it may understandably mean more time spent at the store, but while you’re standing there, think of all the money you’ll be saving. You won’t have to flip the bill for tape, paper or ribbon. Planning accordingly can help alleviate the long waits in line and still enable you to score the free service. Consider shopping at such locations during the middle of the week and/or during the early morning hours. Also, making purchases at these locations earlier on in the holiday season can also help you avoid the long waits. My wife has gone innovative this Christmas. She used my two daughters old shoe boxes as containers for her Christmas gifts. Though she bought cheap paper wrapper, she made it sure that she will be the one to wrap them to get personalize touch. And handwritten the messages on the white paper she handily pasted on the gift box. Happy New Year to the admin. Hoping you good health and prosperous life. That’s really beautiful, some great ideas always!